Just a quick check-in here. First I want to report that the work on my book has finally taken off and is going very well. As I have mentioned, it is a novel, the story of a mother with two daughters, the oldest of whom was kidnapped. The older daughter is most definitely Michaela, although she will have a different name, and the information about the kidnapping is fairly true to life. I do this for a couple of reasons. First of all, this story is engraved in my heart and it wants out. And second, I still keep thinking that somewhere out there, someone, maybe even Michaela, will see that I am looking for her, and perhaps some of the information might ring a bell and result in information that could lead to us finding Michaela. Until she comes home, I must whenever and wherever possible hold that light as high as I can to help her find her way here. I am now into the fictional part. This revolves around the theme of loss, and yes the younger daughter is inspired by my youngest daughter. Even though she was born five years after Michaela was kidnapped, somehow she was born with that loss engraved on her heart, and it has seemed to impact her actually more than any of my other children. She is almost twenty years old now, and life and her spirit have allowed her to navigate those fears she has had since infancy, and to become a gracious young woman. The character in the book deviates in this regard, as she doesn't navigate quite so well, and learns these lessons in a way that is a bit more difficult. At any rate, this is my first actual foray into fiction writing, and I am really excited to report that what my writer friends have claimed is actually true! If you just keep writing, your characters come alive and show you where they are going and how. I've had this book roughly in my head for years now, have mulled it over without writing it down, and part of what has kept me from diving into it is that I haven't been able to figure out how this will work, or how to show that, or what the motivation for the other will be, but magically it has actually started to come to life as the words fall onto the page. This has also been very therapeutic, especially in this month, writing all this down. I have been getting up every morning at 5:00 to write a couple of hours before work. Mornings are my best time, by far. I tend to be tired in the evenings after work -- even more so after getting up two hours early to write, I will admit, but I am always anxious and excited in the mornings to get up and do this. I am doing NaNoWriMo, in which the challenge is to write 50,000 words between November 1st and November 30th, and I am so thankful for this! Honestly, if I wasn't doing that, I would have stopped weeks ago and said, hey, I'm not sure this is right. I would have gone back and fretted over the beginning and would have rewritten it time and time again rather than just getting on with it and getting the whole story down. These doubts are there, and I know that once I am finished there will be a lot of editing and refining that I will have to do, and I pray for the wisdom and strength to get through that! But in the meantime, this is helping me to get it all down, to get it FINISHED, and that is the first step, and has been the real challenge for me. So thank you, NaNoWriMo for the lesson no writing class could have imparted quite so well. This Tuesday, the day after tomorrow, will be the 25th anniversary of Michaela's kidnapping. Honestly, what I want to do is crawl into bed for the day and pull the blanket up over my head. But I have my yellow ribbons, and I am going to go to the store and hang them on the tree again. It will be a small thing. 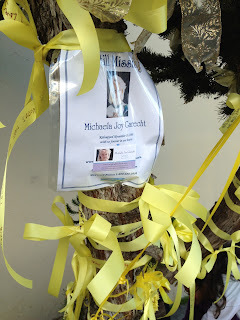 I have posted the event on facebook, but have encouraged people to hang a yellow ribbon for Michaela wherever they are rather than make the drive to Hayward. I have kind of run out of words to say. In the craziness after Jaycee was found, when I was doing interviews from 3:00 in the morning until 9:00 at night and everybody was asking the same questions over and over again, I was so exhausted and I kept wanting to say, umm, can't you just press rewind? But again, I will just say thank you, thank you all so much for loving Michaela. This year we will have a moment of silence during which we will take that love and focus it directly on Michaela, and hope that wherever she is, she will feel it, and it will give her strength. She might not know it's us, and she might not know that we are trying to direct her to come home, but perhaps she will just feel a lift in her spirit, a strengthening in her heart. Okay, I have one more thing to say. I get a constant barrage of complaints from people who over the years do not feel they have received enough attention from the police about the information they believed they had. So first of all, I want to try to paint a picture for everybody of what this investigation has been like. In the very beginning, there were literally HUNDREDS of leads that were pouring in to investigators every single ever loving day. They were completely overwhelmed. The detective at that time told us that they were having to look for a reason to rule out each lead so they could move onto the next. No suspect was completely ruled out unless they were dead or in jail at the time of the kidnapping, but there was so much work to do they could not afford not to keep moving on. It is for this reason that it is believed that the answer to what happens lies in the information that came in during those early days, because there had not been that opportunity to shake things down until the last nut fell out of the tree, so to speak. Our current investigator set out to try to go through much of that information. A room was set up at the police department in which five or six file cabinets held all those leads. He tried to use various helpers to try to first of all get all that information into the computer so it could all be cross-checked. At one point, the National Center for Missing and Exploited Children sent a couple of people out to work on it, but then it seems they changed their minds and decided not to do it. They came for a couple of weeks, worked on it, then left saying they'd be back. A short time later they said, oops, changed our minds. At any rate, it's a hard, hard job, takes lots and lots of time, because there is so much information to catalog. As I've said a few dozen times, we do also have about five really strong leads in the case that have been culled over the years. The work on following these down to their conclusions is immense also. So this is what the investigators are doing. There is currently a post making its rounds on facebook that carries a complaint from somebody that they called something in and the police never called them back, and I have started getting lots of messages from people who are concerned that the police are not doing their job. And this is disturbing me. If you call in a lead, just because the police don't call you back doesn't mean that your lead hasn't been recorded and cataloged within the files and within the investigator's brains. Remember, there is not really anything police can do with a lot of leads. I'm told that this person has actually taken the time to call this lead in again within the last year, but honestly there isn't anything the police can do with a lead that says somebody saw a car matching the description parked in a parking lot 25 years ago. Even 25 years ago, the only thing they could have done was stake out that parking lot, and if they had not had any other information and leads maybe they would have been able to do that, but the fact is they were drowning in information. They did actually look at all those lookalikes people called in. If a name was given, a file was created, and that person was investigated. If you know someone who was in the area at the time who looked like the kidnapper, I'm betting that person was investigated in 1988-1989. Same with the cars. And yes, the investigators did check with all the wrecking yards for cars matching the description, and all the other brainstorming ideas people come up with these days. They worked their a**es off, people. (Kenny Gross lead Hayward PD investigator and Larry Taylor lead from the FBI, and my gratitude is extended to you both wherever you are today.) They CARED about Michaela every bit as much as you do, they loved her like their own chld, and they put their hearts and souls into this investigation, as does Rob Lampkin today. Okay, sometimes today the higher ups in the police department may need a nudge to let loose with the time and resources to continue the investigation. The Hayward PD has this crazy notion that lieutenants should be recycled into different departments frequently, and while they all pretend they think Michaela's case is important, they don't all put their money where their mouths are. If you want to do something, people, rather than brainstorming what the police should have investigated in the beginning, how about barraging the Chief of Police at the Hayward Police Department with letters saying that Michaela's case should be given priority? But as far as those investigators who have loved Michaela and made her a central part of their lives over the years and have fought for the investigation and have worked so hard, well, they have my gratitude, my respect, and my love. This case is perhaps not like many cases, simply because we did have an eyewitness and because the public response was so huge. We have thousands and thousands of leads. Please remember, this is about finding Michaela. I send leads to the investigators all the time. I have to trust them to know whether the leads are of value and whether they need to be followed up, and whether the people who sent them need to be contacted or not. The investigators have a broad view of the case that I don't have, and they know whether a particular piece of information is something that can be followed up or not. For darn sure, I would rather they spent their time doing that than calling me to let me know they got the lead or what they are doing with it. Michaela, you need to know the love that has been poured into the investigation to try to find you. It's not for lack of trying. If we haven't found you, if anything it's actually because so many people were trying to help, not because there was not enough help. The world loves you, Michaela, and the investigators love you, really, really love you, and most of all, I love you. Forever. As long as I'm living, and beyond that. I'm so glad your book is coming along. Once you finish this first novel, I think you will find the next one comes easier to you. I never would have thought it would be all these years without Michaela being found. As always I will continue to pray for her. I will also send a letter to the chief of police of Hayward and beg him to give the resources needed. Hi Sharon, ??? I Found this old PD link and wonder Is someone other than DIANE E.URBAN the Chief of Police now ? She is the current Chief of police. I am a Concerned Citizen writing to you to implore your help with the funding issue that is preventing the resolution of Hayward’s Heart- still missing Michaela Garecht who was kidnapped at age nine. The options for iniquitous intentions of Michaela’s kidnapper are numerous. According to the family Blog: The dedicated Investigators have been working diligently to never let Michaela’s case get cold and have narrowed the strongest leads/ suspects to a sm hand full. Limited funding has prevented the pursuit of these to their much needed conclusion. Hope & dismay has been splintered into numerous directions as news over the years reveal rescues and case resolutions: The piercing unanswered question of Michaela’s location is without relief on the mind and heart. I recently read in a 2010 article featuring your life and many noble accomplishments. As a mother of 2 daughters and a valiant warrior for Justice I have no doubt you can understand the relentless ache loved one’s are enduring. The unsettling unanswered questions continue…. WHO KIDNAPPED MICHAELA? Was 9 year old Michaela kidnapped and remains hidden in 1 offenders home as the RESCUED–3 Cleveland girls held captive & rescued after 10 years--Natascha Maria Kampusch. an Austrian woman abducted at 10 and held in a secret cellar for 8 years. , or is she awaiting rescue at a couple’s home such as Jaycee Duggard kidnapped at age 11 & held hostage for 18 years? WHERE IS MICHAELA? “The Speed Freak Killers” were pushed forward publicly as suspects while the disheartened family and community awaited confirmed ID on a bone fragment from a well. It was not Michaela however the Lead Bureau Investigator halted further searches despite the remaining killer drawing maps of more well locations & indicating there are still to be recovered possibly over 70 victims. It is the not knowing that wounds the soul deeply these long 25 years. If there is anything we as Concerned Citizens can do to untie the dedicated Investigators hands from pursing the strongest leads due to lack of funds could you please let us know publicly. The FBI has been on the case since the beginning: Would an on-line petition to the FBI, the District Attorney’s Office and Mayor requesting added case funding on Change.org. help? -1000’s of us could sign it and get media attention as other causes have received. In the 2012 article featuring your life and career there was a special quote made regarding Officer Trainings . "I remind the men and women that we all wanted to make a difference," she said. "We do in fact serve the public, and we are accountable to them. Look at horses. They depend on me to care for them, to water them and feed them. The community depends on me, and I will not let them down. ''…I believe you! This letter is a Thanksgiving gift to Michaela. Thank you for your considerations in this important matter. I wonder how long I should wait for a response before I try plan B ? I would not expect a response. Do remember, the problem is that the police department has a shortage of resources, so it would be my hope that they would use those resources as best they can to work on Michaela's case, and all the other cases they have, rather than replying to all the letters they get. This is just something that influences their decisions perhaps when allocating resources, hopefully. Thanks. Thanks for responding. I hear you & I hope so too… I remember going to a nursing home to give N.M.T. Therapy and the patient had bruising & other serious problems pointing to NEGLECT. I reported it to the aide, charge nurse, and admin but did not feel heard. After much prayer I took it to the next level and wrote a” letter to the editor” of the nursing home’s town newspaper regarding the findings and in it mentioned the senior advocate program Ombudsman (“The goal of the State Long-Term Care Ombudsman Program is to advocate for the rights of all residents of long-term care facilities”.) http://www.aging.ca.gov/Programs/LTCOP/ The newspaper published the letter! Despite my not naming the specific facility but giving subtle clues some families took action & removed their loved one’s…Eventually enough complaints came in through Ommbudsman that an internal INVESTIGATION took place. Months down the line the Administrator was in the news for “Misappropriation of Funds”— I am not saying this is the root problem in Michaela’s case remaining unsolved for 25 long years but to show an example of how 1 voice can matter- if we “weary not of doing good”. When I saw Michaela's face on the FBI website I thought I saw a resemblance to an old coworker of mine. I went to her Facebook profile, compared the pictures, and thought that Michaela could have grown up to look like her. However, I looked at her family after that and wasn't convinced. Then I found this blog, looked at the family pictures and knew it couldn't have been her. After that I looked around on the blog and found the kidnapper's picture, and looked so much like my dad. Unfortunately, I think he's the type of person who would kidnap a child if he wanted to, and that's how he looked back then. I even asked him where he was that year... I just wanted to help you and Michaela. Sometimes I think that the rest of us just want to help so badly that we see similarities in pictures, discard the differences, and try to rationalize the mistakes that occur when we make these assumptions. After I realized that I was just trying to find anything I could, and I was not helpful, I just stopped and stepped back. I starting following your blog and reading to see if there was anything I could do that would actually be beneficial to you. The people that are complaining about the police department probably felt like I did before I concluded that I wasn't actually helping lol. I'm so glad that you are getting into your book! If you want an extra pair of eyes for editing I would love to help you. I'm a geek when it comes to editing. I understand what you mean, and I appreciate it. I'm someone who is always seeing similarities, thinking people look like someone else. What I would like people to do to help is to share this blog, especially with people in other countries if you know any. What I really hope is to be able to reach out to Michaela herself, if she is alive somewhere. I agree, but unfortunately the age progressions usually do not look like the person. Take Jaycee for example. Looked nothing like her. I agree. I think age progressions are very inaccurate, and they are a huge waste of investigators' time. I swear that in the last week I've received leads about every person in the country with blonde hair and blue eyes. It would be a full time job to try to track all these people down and check them out. Amber's case was closed because someone confessed to having killed her. They rightfully were asking to have it reopened because there is no proof that the person who confessed was telling the truth. Michaela's case has never been closed. Dear Sharon, your continual dedication and never failing loyalty to Michaela is a testament that shall shine forever. My little boy (21 months old) was missing for only thirty minutes before someone recognized him and knew where he really belonged. He is now almost eleven and those minutes still cause nightmares. I cannot help except to pray and to look for a young woman who resembles the age progression composite. I vow to do both daily. Thanks, but if you want to help, please spread the word as far and wide as you can about this blog, and ask your friends to do the same, in hopes that it might perhaps reach Michaela. We do not use the age progression in this way,, because we do not find age progressions to be accurate enough for that kind of identification. In fact, I try not to use them at all. Thanks. I too had my daughters taken from me by the state of Texas, and Im a good loving father with good morals. They were raised in foster care so the child protection services could get money from the state. I was too poor to hire an attorney so for my reward I didn't get to see my daughters for the past 20 years. The poor suffer in this country and no one cares. I just wanted you to know that others suffer also and there is one who cares and will judge. Our reunion will be sweet and the sins of my now wayward daughters shall rest upon them who took it upon themselves to take from me what was rightfully mine. Our reunion will be sweet, as I sit on one side of the judgement bar and the child protection service sits on the other. So it will be for you and your kidnapper when your daughter is brought to you at the judgement bar of Christ. It will be a sweet day! The state does not take children away because you are poor. Actually if you are poor and have children you can get lots of assistance. It takes a lot for the state to take kids away from a parent. They are only taken in the most damaging situation. There are an awful lot of cases I've heard of where the state seems to have behaved pretty outrageously. We can never know for sure what goes on, but Anonymous was just saying he was too poor to afford an attorney, and because of that he was not afforded all the rights he might have been. I'm a paralegal and I know how expensive it is to get legal help. I read the above comment twice. I honestly do not know if I am reading it wrong or interpreting it the wrong way. The anonymous father didn't say the kids got taken away because he was poor. He said he was to poor to hire an attorney to fight what happen. To me that implies two different things. 1 His gets got taken away. 2. He was to poor to get hire a lawyer. Sharon, I apologize for high jacking your thread. I went to leave a comment on your blog and got confused on this particular comment. My heart goes out to you and your family..I've been looking for my nephew for twenty two years I finally got a response from Facebook..not the exact one I wanted but he did answer, he told me he needs time to put all this together and I totally understand its a lot for someone to take in I have faith and hopefully one day I can finally meet my nephew :-) anyway I'm from munith Michigan and I'm reposting for you my prayers will be with you. Good Luck and we will all keep reposting. That's wonderful about your nephew. I have told Michaela in my blog posts that even if she doesn't want to let me know where she is, and if she doesn't want to come home, if she would communicate with me and let me know that she is okay I would be happy just to hear from her! Thinking of you and praying for you tonight. I will pray for the day you see her again...the pain of lossing my son haunts me but knowing what happened to him and knowing i will see my sweet little angle in heaven keeps me going...i am so sorry for the pain and wounder you must feel daily..and pray soon you will have answers.. Thinking of you now and always . . .
Keeping you and Michaela in my thoughts and prayers. Thank you for that post, Sharon.. It's also comforting to know that the you feel the police have done an excellent job, even if under less than ideal conditions. And thank you for giving people something concrete that they can do to help find Michaela. Good idea! my name is Terra Williams. Your daugthers story has always stuck with me, that beautiful face has always been in my mind. I recently read Jaycee Dugards book a stolen life, it made me want to help missing children everywhere. I just want you to know that people are still worried for you and your daughter. Im always thinking of you. I hope that oneday there will be peace in your life. I would do anything to help you even if i am in ohio. Praying everyday for a safe return! God bless. This is a private message for you and possibly your team of investigators. Last night on facebook someone had shared a post on their timeline that caught my attention. It was a picture of one Michaela's missing flyers. In the description she stated Michaela's name & she had been kidnapped from Ca. The reason this particular post caught my attention. She said she saw the get away car after the kidnapping and called the police several times and nobody followed up with her. I did read your post about why sometimes the investigators might not follow up with people. If she didn't see the licence plate or where the car went or some other significant detail maybe that's why it didn't warrant a phone call back. Maybe she did and just didn't specially state that when she spoke to the dispatcher when she phoned into the police dept. It might not be relative, I just wanted to mention it in case your team of professional thought it needed to be further looked into. Here is the link to her fb profile. https://www.facebook.com/lily.g.rocha. The post was made public so you don't have to be on her friends list to see the post. You will however have to scroll down about 15 post to see it. She actually has TWO post of the flyers only one she states about having seen the car after the kidnapping. Georgia I have received dozens of messages about this, which motivated me to write the post above. The bottom line is that you can rest assured our police department is doing its job. I found your blog on November 18, 2013 after following a link on facebook. Since then I have spent the last few days reading every entry on this blog. I can tell that Michaela is and always will be very much a part of your life. I cannot imagine what it has been like for you, Michaela and the entire family since she was taken from you. I have passed Michaela's story along through facebook and will continue to find ways to share her story. I will also continue to keep Michaela, you and your entire family in my thoughts and prayers. I truly hope that you will all find the answers to the questions you've been asking for 25 years. I was just coming here to leave a link to this news story. Such wonderful news that these ladies finally have their freedom. Never give up hope! Thank you, Anonymous, for reminding us just how much goes on that we don't know about. It's not safe to assume anything about Michaela's disappearance or where she may be now. Three more reasons to keep hope alive. I have a question. I was a little surprised see you published the comment posted by one of your readers that said "This is a private message for you." Do you always publish comment from people who state it is a private message to you? Maybe its just my curiosity getting the best of me, since the person stated it was a private message for you, I can't help but wonder if they still would have sent the info if they had known you were going to publish it? If someone sends you a private message, do they need to specifically ask for it not to be published if they don't want it to been seen by all of your readers? Sorry if I am asking something to personal. It just struck me as odd when I saw that comment posted and wondered how it could effect further tips from people who may or may not want attention drawn to themselves. John I read the message and there was no private or personal information in it, and publishing it was the only way to respond to it. An anonymous comment is the best way for a person yo give a lead without anybody knowing where it came from, but my email is also listed on the site for people who want to have offline conversations. Of course if there had been anything personal or confidential I wouldn't have published it, but it was about a Facebook post which happened to be the subject of this blog entry. Think I agree with John. The comment clearly states its a private message. To me that implies they didn't want it published. I also tend to think any kind tip would be considered personal/private regardless if it was sent anonymous or not or came from facebook or somewhere else. In all honesty publishing it was not the only way to have respond to it. You could have simply not published it and just left a comment here on this thread that told the person you got the comment. I didn't realize the subject of this blog entry was about facebook. I thought it was about your book, anniversary of Michaela's kidnapping, and complaints from peope who didn't follow up on leads. Granted the person who left what may be a lead, which is in part what your post was about, it had more to do with that and less to do with the fact it came from facebook. Angie, let me quote my own blog: "There is currently a post making its rounds on facebook that carries a complaint from somebody that they called something in and the police never called them back, and I have started getting lots of messages from people who are concerned that the police are not doing their job. And this is disturbing me." So yes, that is what this blog entry was about. In fact, it was one of the primary motivations for writing that day. And a facebook post is not private, so a comment solely about a facebook post does not contain anything private or personal. I have received many comments that were private that I have not published. But bottom line is, this blog is about Michaela. No more bickering on this subject. I think we require a clarification on my policy on comments on this blog. A broohaha started because I posted a comment which began, "This is a private message..." I did consider this statement, but I looked at it carefully, and first there is no identifying information in it. It was sent by somebody who identified herself as Georgia, but it it not linked to any page or profile. It's a big world with a lot of Georgias in it, so she is completely anonymous. Second, the information, she provided was about a public Facebook post, and not only a public Facebook post, but a freakingly viral facebook post. I know this because I got dozens of messages and emails about it. I wanted to post this comment here, because I wanted to answer to stem the tide of messages. In fact, that was one of my motivations in writing this particular blog post. Yes, I did say that people could post confidentially on my blog and nobody would see the message but me. But remember what this website is about -- a missing child and a criminal investigation. It should be pretty obvious that I was referring to actual leads about the case, or most significantly, Michaela herself. I want her to feel safe knowing that SHE can contact me and let me know that she is okay without having to reveal her location if she can't. I will also respect messages with personal information if you don't want them published but this just was not personal. Second, to Anonymous, you actually do not have any free speech rights here. I used to try to publish all the comments that people left, but that led to some things getting really out of hand. So let me be clear about the fact that the policy of publishing every comment does not exist. If you want to flame, or be rude, your comments will just go into the trash. Joan, that includes your comment. I think you are right on some things, and hopefully this will be corrected by not publishing rude all comments. But it seems you are completely missing the purpose of this blog. The kind of insanity that has come across my box today has actually made me consider closing off comments altogether, but I don't want to do that. It is my hope, as I've said, that Michaela might read this. I really longed for her to be able to see the flyers that blanketed every surface of our town when she was kidnapped, because I wanted her to feel the love poured our to her by the world. That's how I feel about the comments people leave here.I know now that if she can see the love it will help bring strength to her heart, wherever she may be. I apologize, Joan, if you are uncomfortable with me expressing my feelings on this blog, but you don't have to read it. And, do you have children? It is not actually poor judgment to allow an almost 10-year old go two blocks to a neighborhood store with a friend. And I absolutely don't question my parenting skills, as you apparently do. Parenting is an 18-year experiment and I'm at the end of mine. I have raised a bunch of the nicest, sweetest, most whole and healthy kids you could ever in your life hope to meet. So that's my rant for today. If anyone wants to reply, keep it positive. I do not like to refuse to publish comments, but I don't want anybody calling anybody names, not me, not Angie or John, not anybody. Love one another. I'm going to go cuddle my puppies now, while I listen to my son sing and play his guitar downstairs, and I'm going to try to relax and get over this week from hell, cause there is a whole lot of work yet to be done in my little world. Sharon, I missed the post where someone questioned your judgement in allowing two 10-year old girls to go two blocks to the store alone. Even in 2013, with our high level of awareness of the world's craziness, that is not poor judgement! Snatching a child is poor judgement - to put it far too lightly. Michaela, if you are out there and reading this, know that your mother did what any normal mother would do, and that it is not your mother's fault, but rather the fault of whoever took you, that all of this happened to you. I'm going to stop now before I become the one who is ranting. I hope you can forget all of this and have a nice evening, Sharon. I'm sorry that you had to deal with the added stress of negativity from people. No one should question your parenting at all, and NEVER should anyone blame you for what someone else did to your family. I hope this upcoming week is more tranquil for you, and I pray that you can focus on writing your book still. Thanks, Monique. I am way, way, way behind on the writing. I have to get through another 18,000 words in the next 7 days, and they are going to be very busy days! I need to stick to the NaNoWriMo, though, because the words aren't flowing and I'm not terribly happy with what I've been writing. This is the only way I will force myself to keep going and get it all down, and then I will seek outside opinions to help me figure out what to keep, what to toss, and what to add. I have followed your blog for sometime, however have never commented until now. This is for a few reasons. 1. I have often found on blog's or various other sites even facebook, quite often if the blogger/reader's/posters don't know each other personally quite often the written words can be taken out of context and or the wrong way. 2. Although I understandably realize this is your web site and because of this you can run it how you see fit. I must admit at times I have been frankly appalled by some things readers have said and the way you handle it. It's bad enough people find it necessary to contact you and say that stuff, many times the way you have handled it just appears worse. No judgement, just an observation. Guess I was just shocked this stuff goes on, on your site. Most other sites for missing children have a ZERO tolerance policy for this kind of behavior. I LOVE your idea of ONLY posting the positive comments. I have one suggestions/ideas. I'm sure you know they have different widgets for web sites and blog's. My friend has a widget on her blog that is a voice mail widget. Her readers can leave voice messages on her blog. She has to approve them before her readers can hear/play them. Some people just do not come across well when leaving a written comment. My friend loves the vm widget because it allows you to hear the person voice and the tone of their voice. Cuts down on some of the craziness from traditional comments. As I said, I started out trying not to edit comments, out of some idea of honesty. I also actually tried to answer people as much as I could. I was raised to answer when spoken to. I think it's too bad that can't be. I personally am pretty shocked at some of the things that have been left on my blog as well. I do want to clarify that for the most part I really enjoy the comments posted and I enjoy bring able to have conversations with readers. This blog isn't run by a PR firm, it is written by a person, and I think that is important. I am happy to hear you are working on your book. Hope you and your family have a blessed holiday season. Sharon, I was wondering if you read the book ”Stalemate”by “John Philpin ? -If so/or not and you are comfortable sharing, It would be interesting to hear your thoughts on the book either way .I have not bought it yet & despite reading amazon.com book reviewers comments today I continue to be uncertain about the purchasing & reading of it. I have read it. It's an eh. He makes a compelling but not necessarily 100 percent accurate case. I do not personally think Tim Bindner is involved. He was originally suspected because of Angela Bugay, and her killer has been apprehended and it wasn't Tim. He's odd for sure, but probably not a kidnapper. Thanks! I now know for sure I won’t bother to buy it .Accuracy trumps a compelling story any day, especially in such important matters. The recent perplexing nightmare that compelled me to review this book can now be fully put to rest . I can only hope the published book’s exposure helped keep all of the sad cases in the public eye a little more ..